Snail Hollow Gazette: Still bugged about "wiretapping"
I know some continue to entertain serious doubts about the morality of certain government actions being justified under the "defense" clause of the Constitution. It remains a troubling issue, to discern whether it is worse to be under the "protection" of the US Government or to be subject to unannounced attacks by foreign powers. I used to live in Aurora, Colorado, near Buckley AFB. Home of a major NSA installation for listening to the airwaves. 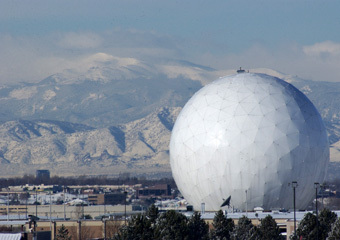 They had dozens of these big golf-ball domes that house sensitive radio equipment for monitoring who-knows-what. And acres of computers to make sure the humans have little to do but turn out the lights at night. The NSA is currently constructing a much larger facility of similar function in northern Utah, near Salt Lake City. The tinfoil-hat crowd is in hysterics over it, but it's really just more of the same, built bigger and better. Several things about the news reporting of this story just drive me nuts, and I can't get past that exasperation. The technology being used is not "eavesdropping", it is intercepting broadcast data. This approach to gathering counterintelligence is not new. It has been in constant use since the advent of radio communications. Publicly broadcast signals are not proprietary or private. Anyone with the appropriate communications equipment can listen to them. Since the data being intercepted is a "wireless" broadcast over public radio waves, by definition there is no "wiretapping" involved. In fact I have a radio set sitting right here beside me that can tune 800MHz cell phone bands. It is perfectly legal for me to tune in the broadcast signals from the public airwaves. I can't understand what anyone is saying because the signals are encrypted. If I knew the encryption key, I could decrypt the signals and hear everything the people are saying. That I don't really care to do this seems entirely beside the point. In any case there are obvious differences here between such a practice and the physical "wiretapping" and "eavesdropping" that media reports are so wont to associate. It is a false parallel. In fact, there is far too much broadcast traffic for anyone to monitor. Imagine trying to scan the Internet continuously. Internet traffic is just a fraction of the data streaming on public broadcast medium. Nobody can monitor all of it, not even Google with their awesome data storage and throughput capability. Not even the NSA, with their antenna arrays and massively parallel data processing. The fact is, nothing is much changed in this matter since it became a topic of public debate, other than the attention being paid by the media. How did this suddenly become an issue for concern? Just because now you think you know something about it? I dunno. Maybe y'all have something to worry about. Personally, I've always laughed at the thought of someone monitoring my boring private conversations. The issue is that they store everything and use an ageratum to extract and sort. because your right there is way to much to sniff through Bluffdale is to be used to Store everything not sort everything. Sorry, you lost me with the term "ageratum", which is some kind of flower, as far as I know. Not clear to me what you are trying to say. Perhaps you can elaborate.